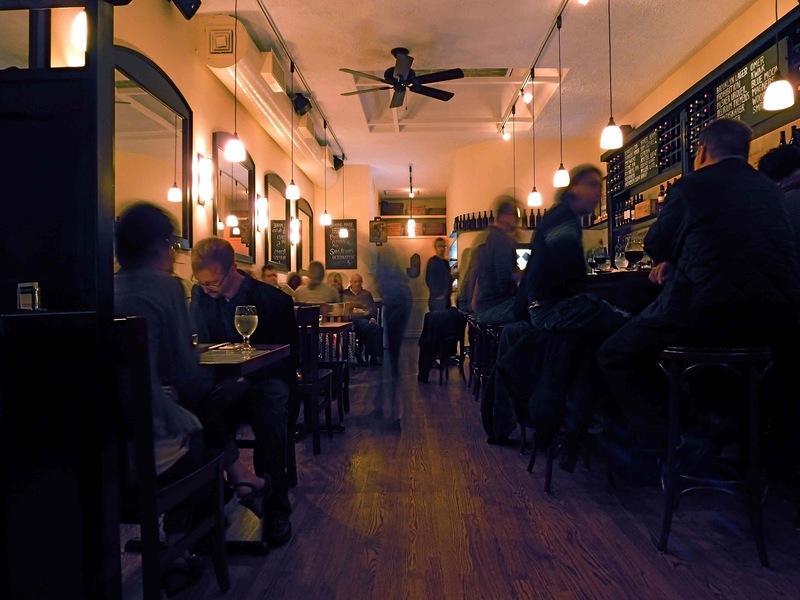 If you're anything like me, you've been itching for Forest Hills to get a wine bar for years. If you're anything like me, you feel like it's hard for a neighborhood to honestly call itself "upscale" without one. If you're anything like me, you feel a sense of relief and joy with the arrival of Jack & Nellie's in the old Q space. At long last we fine fair residents of the 11375 zip code have a real wine bar, not just a few restaurants that sell a few bottles of plonk and don't mind if you sit in the corner with a glass and an appetizer for an hour. It seems that someone read my "Open Letter to Danny Brown" (even if it wasn't Danny Brown) and I can't say I'm displeased with the reply. Elbie and I tried out Jack & Nellie's this past weekend. The few times that I'd walked past since they opened, Jack & Nellie's was packed, so I was worried that we wouldn't get a table. On Sunday, we arrived around 830ish and we were seated right away. About three-quarters full. 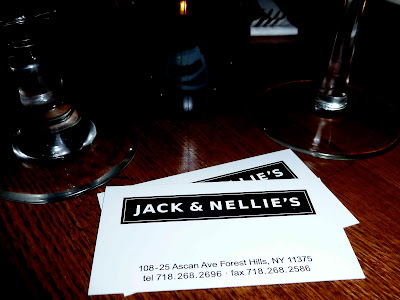 As a side thought, it might be a good idea for Jack & Nellie's to subscribe to OpenTable. Anyway, we sat down, chose a bottle of malbec, began absorbing the new surroundings, and began going through the menu. 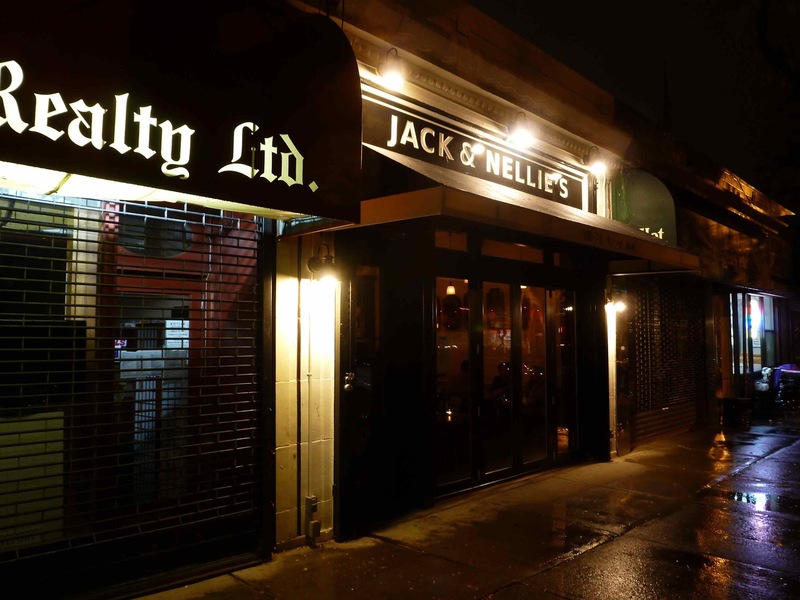 Jack & Nellie's wine list is relatively small, but it's varied and well priced. Our malbec was in the mid $30s. They also have the best beer list in the neighborhood with microbrews and imports dominating the menu. Inside, it's dark. Dark woods, dim lights, high ceilings. Both romantic and masculine, it feels exactly the way I would want a wine bar to feel. My one complaint, and it's a significant one, is that the tables are laid out poorly. Rather than seat everyone perpendicular to the wall, guests are seated parallel to it. The result is that you can feel like you're sharing a table (and a conversation) with the people next to you. 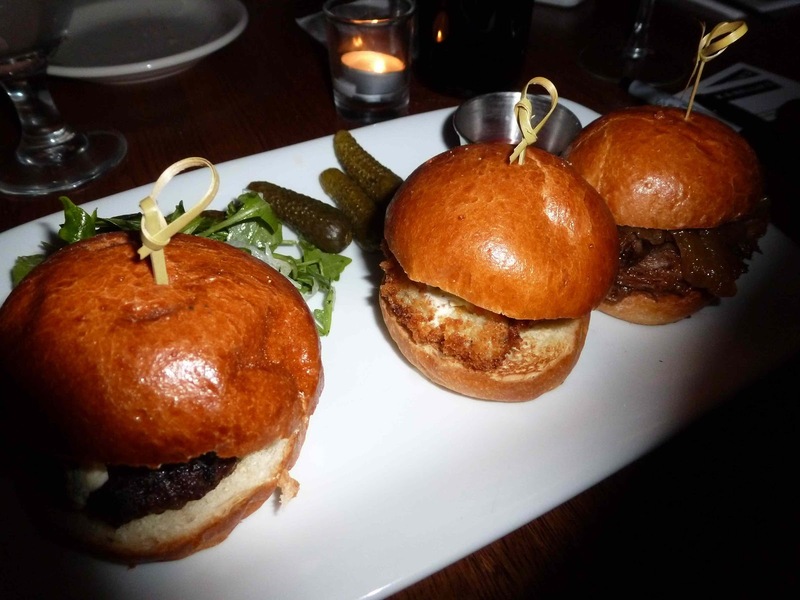 Jack & Nellie's has a small plates menu and we ordered four items. Additionally, there's a selection of cheeses and a charcuterie plate (which I wanted to get but it was just too much food). 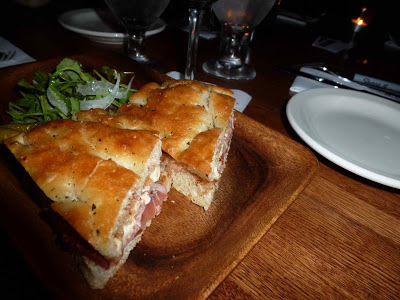 We started out with the Grilled Brie & Prosciutto Sandwich with Fig Jam. Elbie wasn't a fan of it, finding it too greasy and too salty. I thought it was flat out fantastic. I love brie; I love prosciutto; I love foccaccia. Throw it all together and make it a grilled cheese. How can that not be great? At least, that's what I think. Then the Lamb Meatballs with Quinoa & Black Olives came. This time, we agreed that these were perfect. The slider plate came next. You get three and we decided to get one of each offered. The Grilled Angus Beef with Bleu Cheese was pretty good, though the bleu cheese was a little overpowering. Elbie though that the bun was a bit dry. The weakest was the Braised Beef Short Rib with Caramelized Onions which was good, but how can barbecue beef not be good? It was mostly just too sweet and the least interesting. The best by far was the Fried Oyster with Peppered Slaw and Pickles. Fried, but light and tangy. 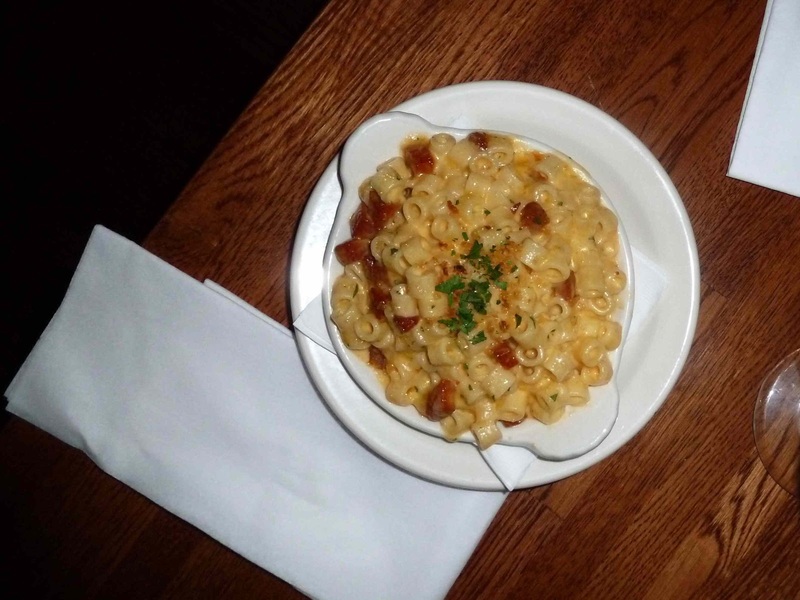 The Macaroni & Cheese with Chorizo came last and was recommended by the staff as something that other diners have liked the most. But Elbie and I weren't blown away. The chorizo, basically a sausage that tastes like thick smoked bacon, made it a little too salty, but then without the bacon, it just seemed generic. The small complaints aside (which I hope are viewed as constructive criticism instead of just my being a prick), I really really liked Jack & Nellie's. They hit the nail on the head when it comes to just about everything I wanted in a wine bar. A tweaked layout and a tweaked menu would define perfection for me. In the meantime, I'll return, expand my sampling of the menu, and be grateful that no longer to I have to schlep across the Gardens to get a decent glass of wine. Or maybe I'll get a beer. Hmm... Should I just become a regular so I don't have to choose? Four small plates and a bottle of wine came to $92 with tax and tip.